Robbie Renwick believes Scotland can field another strong 4x200m freestyle team at the Commonwealth Games. 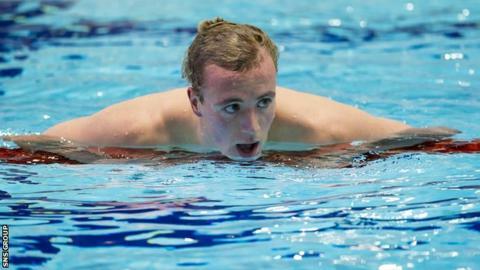 The 25-year-old will defend the 200m freestyle title he won four years ago in Delhi after winning a tough race at the Scottish Championships. "There were a lot of strong swimmers in that final and Scotland can put together another great 4x200m freestyle team," he said. "I can't wait." Renwick was in the Scottish teams that won silver medals in 2006 and 2010. The City of Glasgow swimmer was pushed hard by Dan Wallace and Jak Scott, putting in a powerful last 50m to touch home in 1:47.60. "It's been a tough few days and if I'm being honest I've little recollection of that final," he said. "I can take the next few days to relax then regroup and focus on the summer ahead. "The next few months will be all about training, adopting the right lifestyle, staying sharp and pushing myself. If I do that then the pressure will be off come Games time and I can just focus on the performance." Edinburgh University trio Corrie Scott, Kathryn Johnstone and Andrea Strachan all posted Team Scotland consideration times in the 50m breaststroke final, with Scott breaking the national record in 31.38. The men's 400m individual medley also produced a full house in terms of consideration times from Lewis Smith, Ross Muir and Wallace.